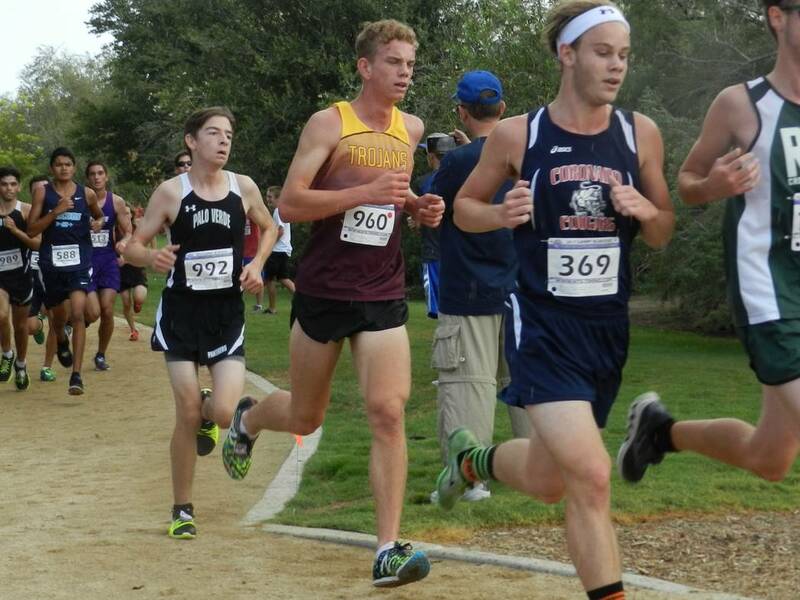 Senior runner Bryce Odegard’s second-place finish out of 97 runners helped the Pahrump Valley boys cross-country team to take second place at the Larry Burgess Invitational. 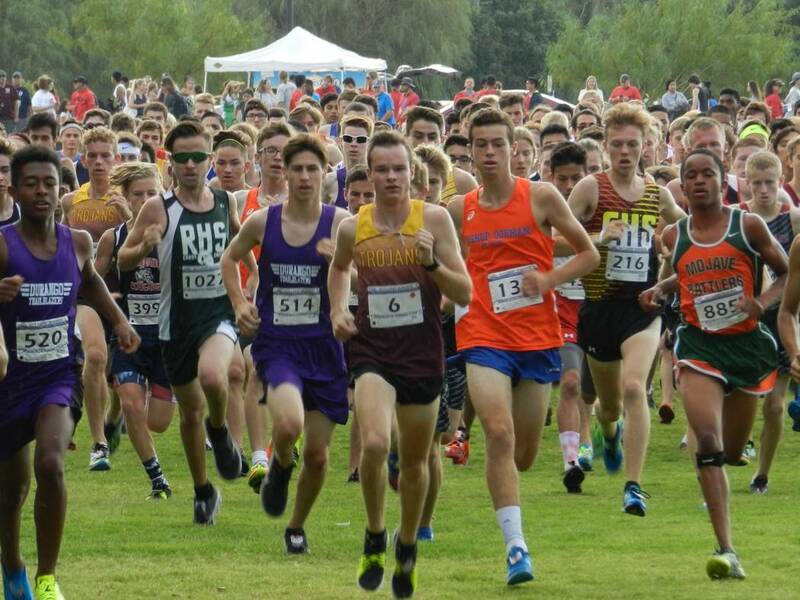 Special to the Pahrump Valley Times Trojans senior cross-country runner Bryce Odegard, (6), can clearly be seen in the middle at the head of the pack on Saturday’s Larry Burgess Invitational at Sunset Park in Las Vegas. Layron Sonerholm is to the right of the runner (in the purple). Special to the Pahrump Valley Times Senior cross-country runner Layron Sonerholm, seen at full speed at the Larry Burgess Invitational in Las Vegas on Saturday. Sonerholm finished ninth (16:43). 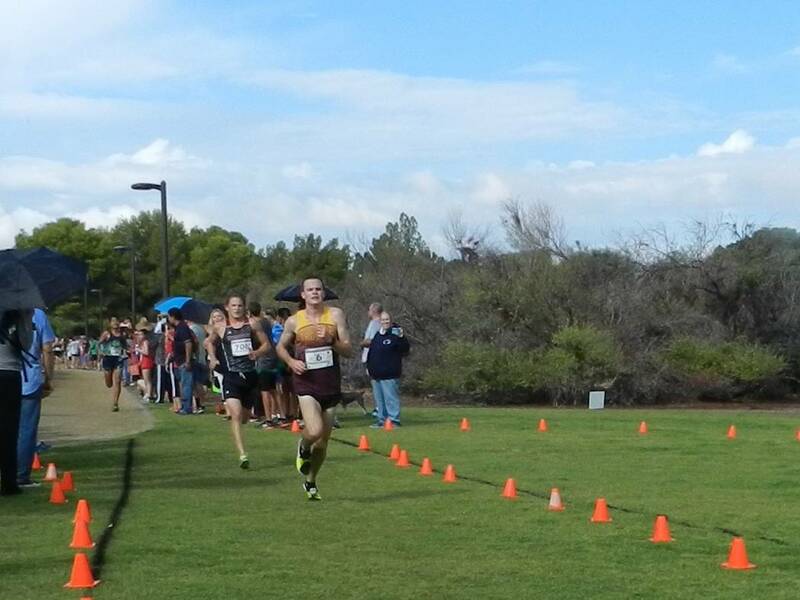 Special to the Pahrump Valley Times Trojans runner Bryce Odegard crosses the finish line in second place (15:29) at the Larry Burgess Invitational in Las Vegas. 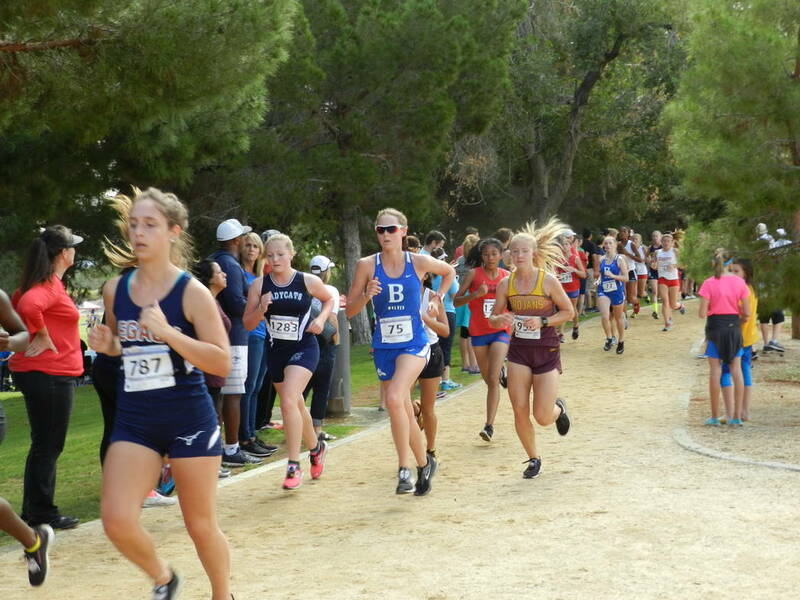 Special to the Pahrump Valley Times Sophomore Terrena Martin (seen to the right of the girl in blue) finished in 26th (23:16) at the Larry Burgess Invitational on Saturday. Taking first on the three-mile course at Sunset Park in Las Vegas on Saturday was Hurricane, Utah with 25 points, Pahrump Valley second (56), Moapa Valley third (116) and Tech was fourth (142). There were 14 small schools in the race. Odegard also finished first among all the Nevada Class 4A schools (bigger schools), which there were 20 of and there were 146 runners in that category. Senior Layron Sonerholm finished ninth (16:43), junior Jacob Cipollini finished 13th (16:58), sophomore Grant Odegard 16th (17:15), sophomore Michael Sonerholm 18th (17:34), sophomore Brandon Ruud finished 28th (18:41) and senior Craig Moore finished 48th (19:53). Kolodzieczyk said he wanted to lower the gap in time between Bryce Odegard and the rest of the boys team after last week’s Labor Day Classic meet. Kolodzieczyk said the Trojans girls cross-country team did well too. Plumb came in 13th place (21:30) out of 70 runners and Goodman finished in 14th place (21:46). Sophomore Terrena Martin finished in 26th place (23:16) and freshman Shailynn Winter finished in 49th place (26:10). The Lady Trojans have a meet today at Liberty and then are at the Moapa Valley Invitational at 8 a.m. at the Clark County Fairgrounds on Saturday.